iMobiTrax was built by Mobile Affiliates, for Mobile Affiliates. There are a variety of Mobile Campaign options you can take advantage of with iMobiTrax. We are consistently adding even more options as we further develop the iMobiTrax Mobile Tracking Platform. Selecting “Yes” to use tracking tokens in your campaign URL. 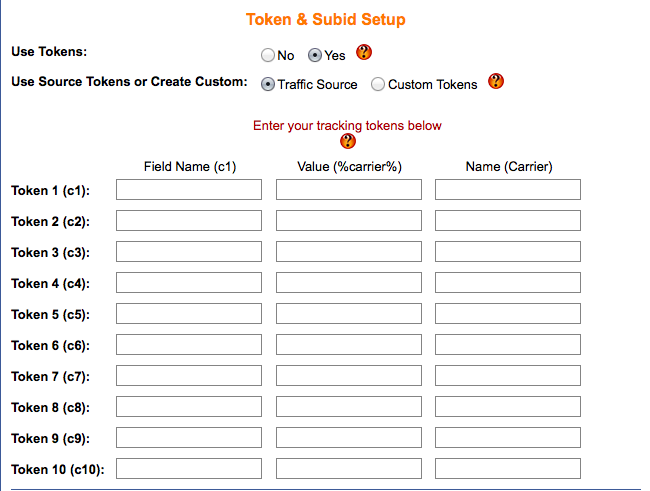 These tokens can be ones provided by the traffic source, or custom ones you create. They will be included in your campaign URL and iMobiTrax will record them on each click and report them appropriately back to you. Use Source Or Custom Tokens – Select “Traffic Source” if you want to use the tokens that you created when you set up the traffic source you will be using. Obviously, you must select the applicable traffic source from the drop down menu above. Select “Custom Tokens” if you want to create/use your own tokens. These can be anything you want, including the tokens provided by a traffic source. Entering Tracking Tokens – Field Name – Enter the name for the query string field for the applicable token, or leave it blank to default to the c value (c1,c2, etc… Do not enter & or =). Value – Enter the value for the token. This can be anything that is needed but is usually a value taken from traffic sources. This will also be the default value if nothing is passed from the traffic source. Name – The name of the token. This is the name that will show up in the “groupby” menu in stats and reports. 10 Available Field Names (C1) (c2) (c3) etc… Field Name – Enter the name for the query string field for the applicable token, or leave it blank to default to the c value (c1,c2, etc… Do not enter & or =). 10 Available Values – Value (%carrier) etc… – Value – Enter the value for the token. This can be anything that is needed but is usually a value taken from traffic sources. This will also be the default value if nothing is passed from the traffic source. 10 Available Names – (Carrier) etc… – Name – The name of the token. This is the name that will show up in the “groupby” menu in stats and reports. Direct Linked Campaigns – Add Unlimited Offers To Your Direct Linked Campaigns. – Split Test Unlimited Offers By Weighted Percentages. 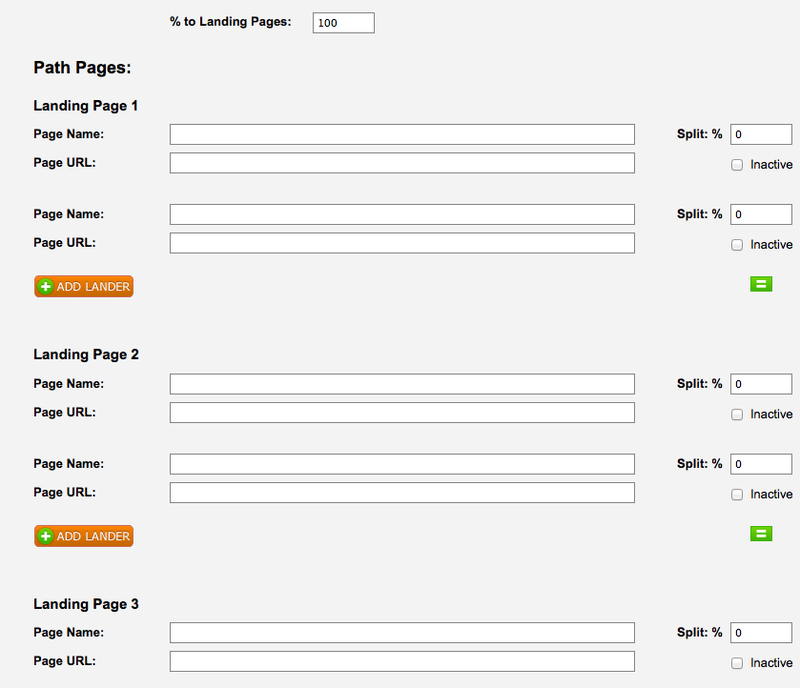 Landing Page Campaigns – Add Unlimited Landing Pages And Unlimited Offers. Path Campaigns – Add Unlimited Path Campaigns. 3rd-Party Postbacks: – Ability to add additional 3rd party post backs. *Optional* You can choose how you want to group your campaigns. Example – Group By Traffic Source, Specific Carrier, OS, Handset, Country, Direct Links, Landing Pages, Affiliate Network, Path Campaigns. Anything you decide. You can edit and delete your Campaign Groups at anytime. Affiliate Networks – You can add any Affiliate Network you like to iMobiTrax by giving it an appropriate name and adding it under the Affiliate Networks tab. You have the ability to edit and/or delete affiliate networks at any time. Traffic Sources – You have the ability to add any traffic source to iMobiTrax. We are fully integrated with every mobile ad network and mobile traffic source in the world. Simply enter your traffic source name, add whether you want to use the tracking tokens provided by that mobile traffic source, click add traffic source and your done. Note: Should you choose to input the specific tracking tokens from a specific mobile tracking source, simply choose yes and a drop-down box will appear for you to insert your Field Name, Value and Name for each token. After that click Add Traffic Source and these tracking tokens will automatically be added in your iMobiTrax campaigns each time you setup a new campaign with that specific traffic source. Field Name – Enter the name for the query string field for the applicable token, or leave it blank to default to the c value (c1,c2, etc… Do not enter & or =). Value – Enter the value for the token. This can be anything that is needed but is usually values taken from traffic sources. This will also be the default value if nothing is passed from the traffic source.